Hang this Gnome Be Gone in your house to keep greedy gnomes, and other voracious eaters, out of the kitchen. 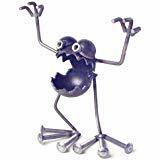 This Gnome is made of steel and recycled items - no two are exactly alike. Measures approx. 8"L x 4"W x 5.5"H. They are designed to rust or they can be sprayed with a clear acrylic enamel spray. For years, the original Gnome-be-Gone sculptures have worked to scare off those pesky garden gnomes. Now, dressed as their favorite mighty superheroes, the Gnome-Be-Gones are finding new and creative ways to disburse justice on gnomes and avenge the garden! Each Garden Avenger is individually assembled from reclaimed metal in Utah and designed to develop a natural rust patina outdoors (and may already include traces). Choose from the Captain, the Bulk, and Thor - or assemble all 3 to defend your garden! The Captain - Donning his winged mask, the Captain stands ready to defend your garden with his keen, super soldier senses and dependable, indestructible shield. Stance will vary slightly. Finally - a way to rid your yard of those pesky garden gnomes! Position a couple of these Gnome-Be-Gones prominently in your flowerbeds and be free of those disturbing little Euro garden invaders forever. 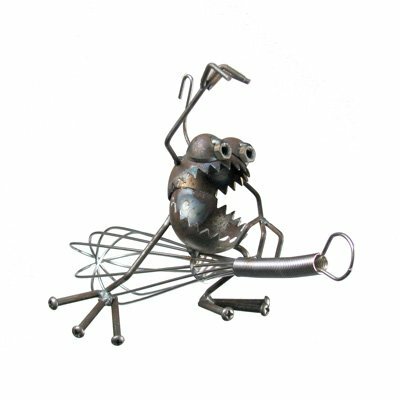 Designed to rust naturally, each Gnome-Be-Gone sculpture is individually handcrafted in Utah and signed by the artist. (Product not recommended for those without a sense of humor). Gnome Be Gone Mini Kitchen Witch Sugar Post Metal Gnome Be Gone Series Hang this Gnome Be Gone in your house to keep greedy gnomes, and other voracious eaters, out of the kitchen. 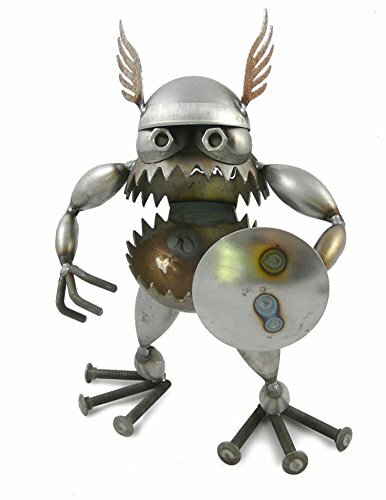 This Gnome is made of steel and recycled items - no two are exactly alike. Measures approx. 8"L x 4"W x 5.5"H. They are designed to rust or they can be sprayed with a clear acrylic enamel spray.